We recently made a trip to the Netherlands for a chance to meet up with a watch collector with a thing for Speedmasters. That is to say, his Speedmaster collection is all kinds of awesome, and in that collection, sits an Ultraman too. Not having one reserved, it was nice to finally see this piece in the metal. So let’s see what the fuss is all about. First up, let me say the watch looks better in real life than it does in pictures. I found the ‘orange’ a bit loud in the pictures, yet in reality it’s absolutely fine and makes for a fun twist to the Speedmaster formula. Let’s discuss the case for a minute. 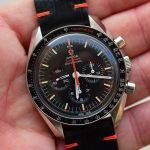 While the first SpeedyTuesday had an all brushed case, this particular edition has the exact same case as you’d find on the standard Speedmaster Professional ‘Moonwatch’. Meaning it has a mix of brushed & polished surfaces. The case back is also exactly the same. 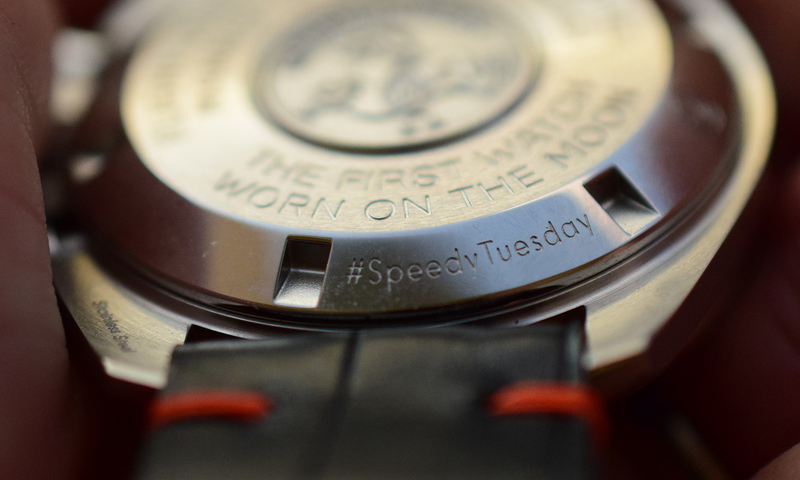 Minor detail is that you’ll find the hashtag #SpeedyTuesday engraved on the case back and the number of your watch in this limited series (e.g. 007/2012). The details to look for are thus essentially found on the dial & bezel. The main standout is of course that big orange central seconds hand. And when looking closer, the stepped dial & subdials become more apparent, and that’s where things get interesting. The bezel has that collector’s favorite ‘dot over 90’ and features the word Tachymètre in orange. When looking at the dial, the orange & fauxtina hour markers are the most obvious changes from the standard speedypro. I am not usually one to like fauxtina, but here it somehow works as it plays nicely with the deep orange accents. Moving closer and tilting the watch ever so slightly, you’ll see the dial hides a lot more details. The stepped dial & subdials are easily my favorite aspects of the watch. The watchful eye will have noticed that the seconds subdial has a bit of a funky relief going on. This is the not-so-hidden ‘ultraman’ silhouette. This silhouette only lights up when placed under the (complimentary) UV light. 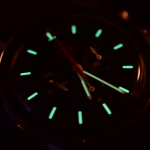 So this will not light up like lume, it is only visible with UV light. 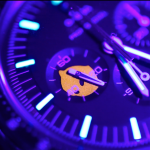 The actual lume on the watch, is much less than on the first edition of the SpeedyTuesday watch, as this one has pretty much exactly the same lume pattern as found on the standard moonwatch. In fact, it has a bit less lume than the standard moonwatch, as the orange seconds hand has no lume at all. The detail that is shared with the previous SpeedyTuesday edition, is the lovely applied Omega logo on the front and the engraved #SpeedyTuesday on the back. 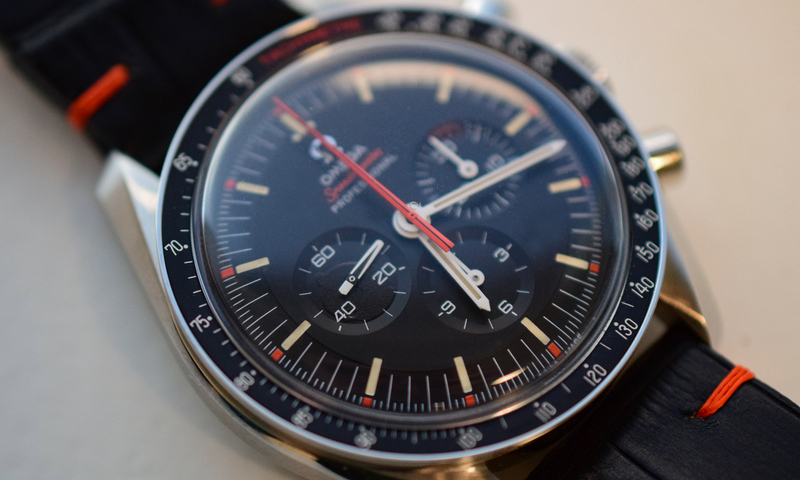 Overall, a fun watch and a great addition to the Speedmaster line-up. Sincere thanks to Watch Works Haarlem for providing us shelter & warm coffee so that we could take these pictures, shoot video and discuss watches. 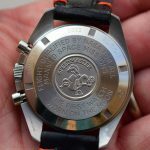 Interesting to see some real pictures and video of this watch. The lume-shot on omega’s website actually shows the Ultraman face lighting up so I actually wasn’t expecting this. 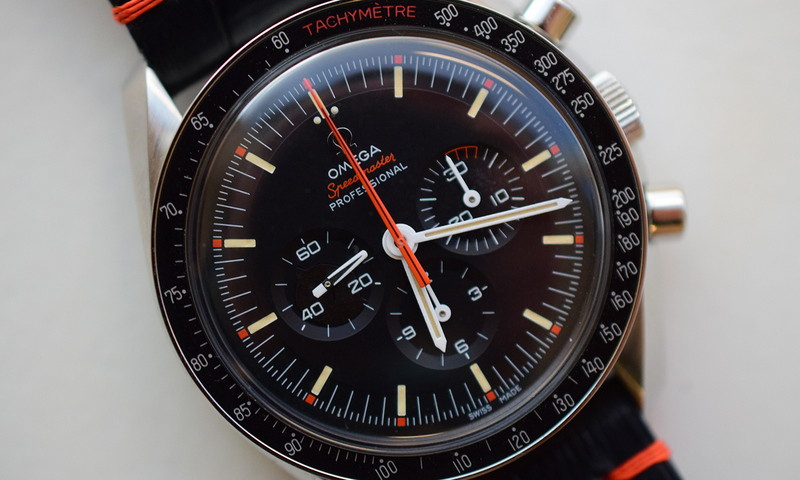 I know, it’s written in the description of that very picture, but I didn’t read them thoroughly as I’m not into the Speedmaster as much. Looks great, awesome write up! Just curious though, does it share the same lug width as other Speedy Pros at 20mm? Yes absolutely. Its pretty much the exact same as the pro. Only difference is the dial & hands (and no bracelet). Thanks!